In this modern era of technological advancement, e - commerce has emerged as an important economic partner for any country. The simple & quick purchasing model, different & easy payment methods and cash on delivery services with suitable return policies , have made the e - commerce industry highly significant. Customer satisfaction is high in this mode of online shopping and trading , globally. Therefore, the central objective of this research is to describe the role of e - commerce industry in the sustainable economic development of Iraq, with a wide range of e - commerce trends in different niches to facilitate natio nal & international consumers. Hence, special attention is paid towards the role of e - commerce, customer satisfaction via this innovative & rising business way in Iraq. To explain further , four hypotheses are taken concerning the e - commerce in technologica l context, organizational, environmental & individual context s . An online survey was conducted, and detailed questionnaires were distributed , in which simple random technique was used. Due the limitations and emerging e - commerce industry in Iraq, initially 50 questionnaires were distributed among the top level e - commerce websites across the country. This research shows the results that innovative & personal research in IT sector, especially in e - commerce which plays an important role to grow the industry . It contains a bright future if government plays it s part as individuals are advancing with their innovative & creative ideas. SMEs have direct link s with this industry to create employment in the country too. The buying trend is increasing through e - commer ce, which has positive impact on country’s economy. The current study is significant to prove the main role of e - commerce industry in sustainable economic development in Iraq. Hence, the study is supportive for e - commerce companies & websites to lessen lat est online buying trends, e - paying methods and customer satisfactory ways in modern world. E-commerce, Sustainable Economic Development, SMEs, Fuzzy Logic, Iraqi Enterprises, Information Technology (IT), Internet, Small to Medium-sized Enterprises (SMEs), Developing Economies. Electronic commerce, (E-commerce) is an emerging business trend in Iraq, which is rapidly changing the traditional market system of the country into digital one. Mix and specific niche containing websites & online stores are developed rapidly by the IT sector to promote various national & international products and services. Different items are being displayed at a lot of online stores, which are flourishing the Iraqi economy with high. Millions of buyers come online on daily basis from different devices (Desktop computers, laptops, tabs & smartphones) for shopping due to sustainable e-commerce development in Iraq (Xiao et al., 2017). In this promising e-commerce industry of the country, different level businesses as well as companies are putting their parts. Here, SMEs are special, which are adding particular products & services via these online stores & websites (Rayport & Jaworski, 2003). In 2003, some SMEs adopted the e-commerce method; this became a positive step towards getting new customers’ attention towards online shopping, and this is beneficial for country’s economy. The adoption level of this new trend is high not only for manufacturers but also for different buyers. All these things are discussed in the light of research work & literature presented by experts in past. Modern research methodologies are adopted with online techniques to get the latest & updated data, and this data is analyzed under the statistical & scientific principles. The adopted & chosen methods proved the positive rising role of e-commerce in the Iraqi economy, which is beneficial to create not only businesses but also jobs for IT, commerce & supply chain experts. Supply chain & it’s better management is the important part in any country’s ecommerce industry. If it is advanced, systematic and upgraded, then e-commerce will grow, otherwise it has direct impact upon it. So, the betterment of supply chain, especially logistics & couriering should be modernized to keep the ecommerce industry on right track (Kousaridas et al., 2008). Technological, organizational, environmental & individual contexts are one of the important parts of this research to understand the role of e-commerce industry in the sustainable economic development of Iraq. Complete analysis is given to describe & define the study including graphs, charts, statistical & mathematical results, which are the important parts of this research. At the end, comprehensive & resulted remarks are provided, which conclude this e-commerce based research work. • From a transportation viewpoint: E-commerce is the deliverance of information; goods/services or expenditure via telephone landlines, mobiles, computer networks, internet, or any other way. • From a business process perspective: E-commerce is the application of technology towards the mechanization of business transactions and workflow. • From a service standpoint: E-commerce is an instrument which goes to the need of stiff; customers; and organization to cut examine costs, while manufacturing the excellence of products improved and rising the swiftness of the given that service. • From an online standpoint: E-commerce gives the capability of trading and selling goods and information on the Internet, also uses some online services. Consequently, it could be said that e-commerce was an achievement of a connection between purchaser and vendor, in export and importing products or services and paying by a lot of kinds of digital payments. This fraction of trade was set apart from having many ways which the goods/services went throughout from 1 to 2nd and 2nd to arrive at the last client. 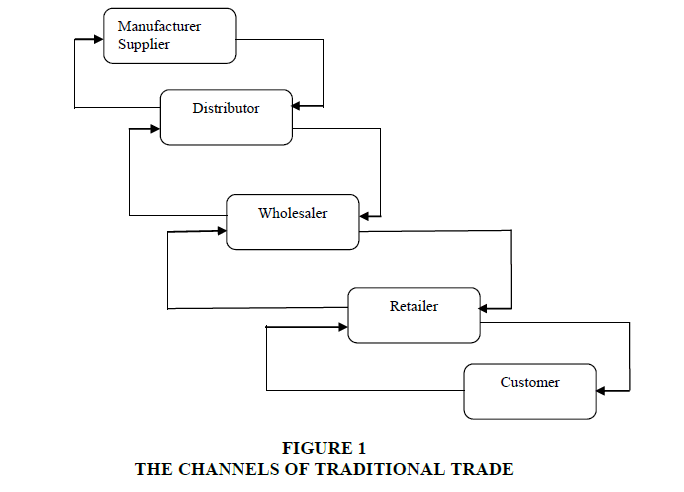 As shown in Figure 1, the goods/services moved from producer or dealer to the distributer who puts up for sale it to the merchant or trader and, then, it is sold to the end consumer. In this procedure, each agent added the charge and income border to the cost of the goods/services and, by the end, the cost was higher than the original cost recognized by the producer/dealer. Also, it took some extended time because of transport and sharing from one control to another (Kalakota & Whinston, 1996). 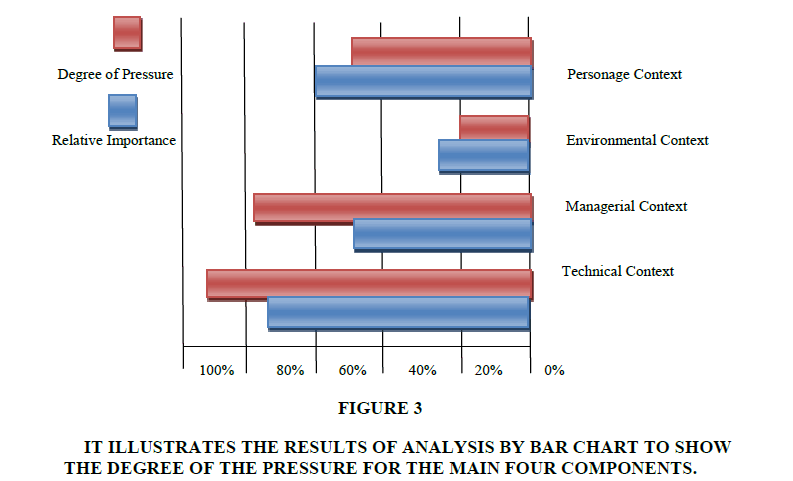 Figure 3: IT Illustrates The Results Of Analysis By Bar Chart To Show The Degree Of The Pressure For The Main Four Components. i. Client to Client (C2C) where customers in a straight line carry out with other customers in the internet. It can be recognized C2C communication as significant mock-up in Internet based dealings and sharp the corporation needs to acquire it into deliberation within their marketplace planning attempt. Their declaration is exemplified by the enlargement of social network site in current times. ii. Business to Client (B2C) is where consumers are taught in relation to goods or services throughout electronic make known, and purchase them using electronic cash and secure payment systems, and have they delivered electronically or through corporeal channel. iii. Business to Business (B2B) is e-market business in which traders, firms, and other organizations based on computer-to-computer shipping as a quick, an inexpensive, and a reliable way to behavior trade dealings. iv. Client to Business (C2B) is category of online dealings where customers are trading with corporation. v. Client to Government (C2G) is category of online communication where response is specified to government through group or individual sites. vi. Business to Government (B2G) is category of online communication where response from trade is given to government and non-government association. vii. Government to Citizen (G2C) is category of online trading through which government present nationwide dealings such as restricted administration services, countrywide government information, and tax information. E-commerce is described as the systematic trading way of goods as well as services by electronic ways such as Internet, e-mail and exchanges of electronic information. E-commerce shapes an imperative part of “electronic behavior”, a broader expression which refers to the mechanization of any profitable procedure by electronic ways (Rayport & Jaworski, 2003). The making use of e-commerce is a mirror image of the planned compass reading of an enterprise, and can be typify by the degree of communications, such as interactions of information, announcement, sharing, dealings and/or partnership in the trade procedure (Huy et al., 2006). An enterprise can be by means of e-commerce at present, or map to use it in the future. The degree of making use of e-commerce can be calculated by whether or not the enterprise at present employs or will soon employ at slightest one form of the technology linked with an electronic system (for example, the swap over of computerized information (EDI: Electronic Data Interchange), the Internet, Intranet and Extranet, etc. ), and by whether or not it at present employs or will employ such inter linking for trade connections (Thong, 1999). i. Users (or first adopters): At present employ a form of e-commerce technology. ii. Declared prospectors: Map to employ it within three years. iii. Declared late-comers: Map to employ it in extra three years of the time, or not employ it at all. The technical background describes the feature such as apparent advantage, compatibility, and price that puts pressure towards the acceptance of e-commerce technology. The apparent advantage refers to the measure of getting the possible reward that e-commerce technology can supply for the association. Superior decision-making concerned to the relation return of e- commerce adoption lift up the prospect of that corporation assigning some assets, such as decision-making assets, monetary assets and technological assets, to adopting e-commerce technology. Then, ability refers to what degree of e-commerce is suitable with technology communications, civilization, worth, and labor follow that previously subsist in the firm. A novelty will be simply established in an association if it is melody in with the existing principles of that association, can assemble the wants of association and agreement with association civilization. Compatibility connecting association policies and technology novelty will make the novelty easier to be shaped in a more recognizable background. In this article, price is also painstaking as a feature that pressure Iraqi SMEs in their adopting e-commerce. More often than not, the less luxurious the price of a convinced technology the extra likely it will be swiftly adopted and put into practice in an association. The managerial background refers to the individuality of the firm that might pressure the adoption of e-commerce technology. Technology willingness is one of the managerial circumstances planned in this research as determinant aspects that pressure SMEs in adopting e-commerce. Technology keenness refers to what degree the technology communications, pertinent schemes and technological ability in trade can hold up e-commerce adoption. Technology inclination consists of both technology transportation and IT person possessions as well as both are actually needed if the company wants to make e-business an essential fraction of the worth sequence. Therefore, the better the technology keenness of an association the extra possible the association take on IT technology, and vice versa. One more aspect in executive background that is recognized as a determinant aspect of e-commerce adoption by SMEs is firm dimension. This is firm dimension which is connected to the aptitude of trade to give convinced possessions, both monetary and person assets. The bigger the size of trade means the bigger its aptitude to give convinced assets, and the extra probable the adoption of e-commerce technology. The ecological feature refers to outside pressure such as force from clientele/dealer, force from a contestant(s) and outside hold up that power e-commerce adoption. In this document, the client/dealer force tells the level of force from clientele/dealer apparent by SMEs. In a lot of cases, the client/dealer has the authority to force an SME to take on an exacting type of knowledge. For example, international business frequently pressed their branches and contractor to adopt e-commerce technology to relation into their worldwide manufacturing system. Consequently, the bigger the force from business associates apparent by the SME, the further possibly they are to adopt sure technology novelty(s) in order to uphold their own spirited location. The contestant force refers to the degree of force from rivals inside the business as felt by the firm. When rivals set up to employ e-commerce technology, firms will be pushed into adopting e-commerce technology extra extensively to get spirited reward. Thus, the senior the height of rivalry inside the business, the extra expected it is that better e-commerce usage will be attained. As well force from client/dealer and rivals, hold up from outside parties such as management and IT salesperson is also careful in this learn as one of determinant aspect of e-commerce for taking off by SMEs. As usually known, SMEs have incomplete assets; monetary capital; and IT skills assets, and so hold up from the government from side to side policies or system that can defend the gathering concerned in the trade transaction; directive of the employ of the internet to create it as a safe medium for dealings; stipulation of inducement for corporation to employ e-procurement; or a hold up from IT vendor those are all supposed to force trade, particularly SMEs, to adopt IT technology. In adding up to the three contexts make clear above, in this document independent findings are also measured as determinant aspects of e-commerce adoption by SMEs in rising countries. This is for the reason that more often than not in SMEs a planned selection which is extremely needed for the boss/proprietor. Some researchers exposed that the e-commerce adoption by SMEs at length based on the receiving of e-commerce technology by the proprietor of trade. This is sensible, because structurally SMEs be inclined to unify, hence the proprietor/boss have a significant position in any trade conclusion creation. In this work, three individual contexts: proprietor innovativeness, title-holder IT knowledge and vendor IT aptitude are recognized as determinant aspects that power SMEs in adopting e-commerce. In this research, innovativeness refers to the extent to which a human being adopts novelty more rapidly than others in the identical communal context. A businessman who tends to look for an explanation by altering the arrangement where the dilemma is situated is more often than not careful an inventive boss (Thong & Yap, 1995). It involve that the novel boss favor to look for an answer that has by no means been attempted before and consequently is supplementary dangerous. As a technology novelty, e-commerce also has jeopardy, particularly if it is practical in minute trade and even more in rising countries. Therefore, the more inventive the SMEs proprietor, the additional likely they have a purpose to adopt an e-commerce application. In this research, owners’ IT aptitude and knowledge are also recognized as determinant aspects of ecommerce adoption by SMEs in rising countries. As usually recognized, inadequate IT skills is one ordinary SME difficulty (Lawrence & Tar, 2010). If the SME owner has better aptitude and superior knowledge with IT, they will be sure in adopting IT and it will decrease the doubt and danger in that technology adoption. In adding up to this, it is also supposed that consumer ability and information can help and add to the velocity of technology adoption (Hall, 1995). More prominently, it assumes that if boss/proprietor understands the purpose and compensation of e-commerce adoption, they could be additional satisfied to take on such technology. Hypotheses: The adoption of e-commerce in SMEs in Iraq is different depending on four factors (from H1 to H4). For research purpose, a technique was made on the basis of online survey. This was selected because of its benefits, namely: low priced, improved, quicker, and easier than other techniques. The survey was developed by suggestion to prior review. Objective respondents for this article were vendor/supervisor of Iraqi online businesses or SMEs. In this research, SMEs refers to a trade which has fewer than 100 employees, resources not as much of that 1 million US dollar and full amount sales per year less than 5 million US dollar. In Iraq, here is no federal record that stores data regarding all Iraqi online stores, websites and SMEs. Most of information resource accessible in Iraq arrives from the information which composed and stock up by quite a few parties. Depends on a variety of information foundation, 960 SMEs were selected as example structure for this review and 20 SMEs contribute in this study. The adopted pointers to calculate the free variables were 55 markers, classified to 11 free variables. Table 1 demonstrates the kind of free variables, the statistics of their markers, and their references. All of the actions in this article working 5 tip Likert Scales, approved a dependability test obligation, with Cronbach’s Coefficient Alpha value greater than 0.83, and examine by Fuzzy logic tools. Precieved Advantages 10 Limthongchai & Speece, 2003; Rahayu et al., 2015; Morteza et al., 201; Al-Qirim, 2007. Compatibility 7 Limthongchai & Speece, 2003; Rahayu et al., 2015; Morteza et al., 2011; Al-Qirim, 2007; Grandon & Pearson, 2004. Price 4 Limthongchai & Speece, 2003; Rahayu et al., 2015; Morteza et al., 2011. Readiness 6 Limthongchai & Speece, 2003; Premkumar, 2003. Organization size 3 Limthongchai & Speece, 2003; Rahayu et al., 2015; Premkumar, 2003. Clients/ Suppliers presudes 4 Limthongchai & Speece, 2003; Rahayu et al., 2015; Morteza et al., 2011. Rival Pressure 3 Limthongchai & Speece, 2003; Rahayu et al., 2015; Morteza et al., 2011; Molla & Licker, 2005. External Support 5 Limthongchai & Speece, 2003; Rahayu et al., 2015. Innovativeness 4 Limthongchai & Speece, 2003; Rahayu et al., 2015; Morteza et al., 2011; Sila, 2013. IT Ability 5 Limthongchai & Speece, 2003; Rahayu et al., 2015; Morteza et al., 2011; Sila, 2013. IT Experience 4 Limthongchai & Speece, 2003; Rahayu et al., 2015; Morteza et al., 2011; Sila, 2013. The dependent variable is e-commerce adoption which is lightened by the extent of e-commerce employ by SMEs. 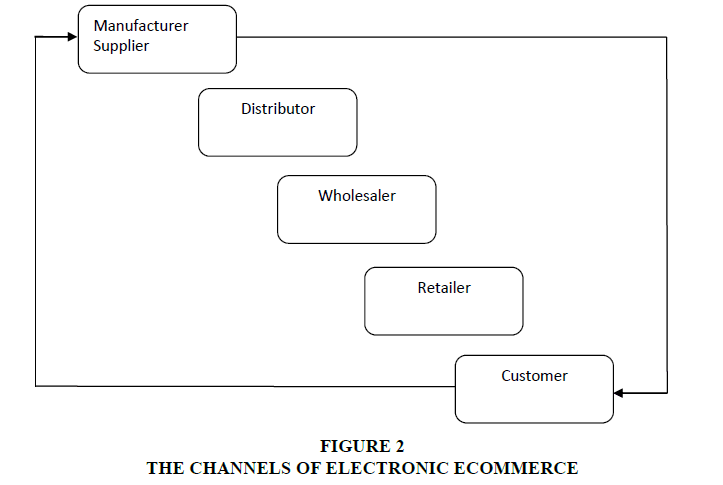 The extent of e-commerce employ refers to “the degree of e-commerce employ for a numeral of dissimilar behavior in the significance sequence, from promotion and advertising to auction, procurement, examine and hold up, information swap over with clientele and contractor, and incorporation of trade procedure”. In this research, respondents were asked regarding whether they employed or did not employ e-commerce knowledge in such actions. The scores (yes=1, no=0) were build up and this calculation is accepted from the Gibbs and Kraemer, 2004 study (Thong & Yap, 1995). For the purpose of this paper, 50 questionnaires were prepared by the researchers and distributed to a sample of random managers and owners in 20 online store owners or SMEs in Iraq. The survey consists of 11 perspectives with multi indictors for each one of them. The researchers processed the data of the 50 questionnaires and analyzed them by Fuzzy logic tools and using Mat Lab 10. 1. Shaping the necessary ratios of the consequences. 2. Shaping the weights of ratios and questions. 3. Shaping all the ratios depends on the data of the survey. 4. Shaping all the ratios according to their weights which resulted from step 3. 5. Shaping the rate of the linguistic variables by presumptuous a charge value to every linguistic capricious by separating the weight of each ratio into the number of linguistic variables. 6. Shaping the rate of triangular fuzzy statistics by means of the function of fuzzy logic in Mat Lab ver.6.5. 7. Calculating the biased rates of triangular fuzzy statistics. 8. Calculating the fuzzy detachment of each ratio by using the equations (1) and (2) (Gibbs & Kraemer, 2004). In this article the 11 variables are classified into four groups: technical contexts, managerial context, environmental contexts and individual contexts, all are cleared as determinant feature that manipulate Iraqi SMEs in adopting e-commerce technology. There are 3 components described in technical contexts, this article persuades Iraqi SMEs in adopting e-commerce, these are professed reimbursement, professed compatibility and price. It was set up in this research that the apparent advantage has helpful and important association with the adoption of e-commerce, which means that the apparent advantage is one of determinant features of e-commerce adoption by SMEs in Iraq. Therefore, H1 in this research is fully held up. Knowledge willingness and solid dimension which are classify as managerial context are defined in this research as determinant features of the adoption of e-commerce by SMEs in Iraq. However, depends on the Fuzzy logic examination, it is ascertain that it is only skill willingness that has an optimistic and important association with the adoption of e-commerce, while firm size does not. Hence in this research, H2 is fully supported. Owners’ innovativeness, owners’ IT experience and owners’ IT information, which are classify as personage contexts, are described in this article as determinant features that pressure SMEs in Iraq in adopting of ecommerce. The Fuzzy logic research shows that all of these components have a helpful and important association with the e-commerce adoption. Therefore, H4 is also fully supported. E-commerce industry is emerging & flourishing in Iraq rapidly. • E-commerce has become an important component in business strategy for a sustainable economic development in Iraq; a major part in economy is arriving from this electronic commerce. • Some popular online stores which are putting a major part in Iraqi economy via e-commerce are as: Elabelz, Mango, Miswag, Newegg, Spread Shirt, Namshi, Bazaray, among all these Amazon & EBay offer their services in the country. • Millions of people are getting new jobs, daily work and handsome monthly income via rising e-commerce industry in Iraq. These are: IT experts, sales personnel, marketing managers, courier suppliers and labors. • The link between e-commerce or online stores & courier services is important, this is major part in supply chain and delivering of different products like electronics, computer accessories, apparels, books, fashion goods, tools and other products. Conclusively, electronic commerce (e-commerce) has become a major part in Iraq’s economy to make it stronger, modernized and fast growing. IT experts, business personnel and logistic companies along with courier groups have become the major role player in this industry. New shopping trend via innovative and interesting products has been developed; those people who were not buying usually from traditional markets are also buying from different famous online stores. This is a positive indicator in country’s economy to make it sustainable not only for SMEs and private sector but also for government organizations. A comprehensive research is conducted in which useful and most relevant data was collected carefully from linked people. Through questionnaires, information was collected from top level e-commerce players of the country then analyzed scientifically. All this research work proves that the role of e-commerce industry in the sustainable development of Iraq cannot be ignored, which is opening the doors of new markets, products, customers and employments. All this goes towards a bright and fast growing economic system. SMEs and private businesses are playing leading role in it. Government should also play its role via its IT & business ministry to boost it, so that a huge profit can be got exclusively. Al-Qirim, N. (2007). The adoption of e-Commerce communications and applications technologies in small businesses in New Zealand. Electronic Commerce Research and Applications, 6(4), 462-473. Budiarti, I. (2017). Knowledge management and intellectual capital-A theoretical perspective of human resource strategies and practices. European Journal of Economics and Business Studies, 8(1), 148-155. Efendioglu, A., Yip, V., & Murray, W. (2004). E-Commerce in developing countries: issues and influences. San Francisco: University of San Francisco Press. El-Hossainy, T.M. (2011). A fuzzy model for multi-criteria evaluation and ranking of technicians. Journal of King Abdulaziz University: Engineering Sciences, 22(1), 99-118. Fraser J., Fraser N., & McDonald F. (2000). The strategic challenge of electronic commerce. Supply Chain Management, 5(1), 7-14. Ghobakhloo, M., Arias-Aranda, D., & Benitez-Amado, J. (2011). Adoption of e-commerce applications in SMEs. Industrial Management & Data Systems, 111(8), 1238-1269. Gibbs, J.L., & Kraemer, K.L. (2004). A cross-country investigation of the determinants of scope of e-commerce Use:An Institutional Approach. Electronic Markets, 14(2), 124-137. Grandon, E.E., & Pearson, J.M. (2004). Electronic commerce adoption: an empirical study of small and medium US businesses. Information & Management, 42(1), 197-216. Hall, C. (1995). APEC and SME Policy: Suggestions for an action agenda. University of Technology, Sydney. Hawk, S. (2004). A comparison of B2C e-commerce in developing countries. Electronic Commerce Research, 4, 181–199. Hsu, Y.A. & Fang, W. (2009). Intellectual capital and new product development performance: The mediating role of organizational learning capability. Technological Forecasting & Social Change, 76(1), 664-677. Huy, L.V., & Filiatrault, P. (2006). The adoption of e-commerce in SMEs in Vietnam: A study of users and prospectors. The Tenth Pacific Asia Conference on Information Systems (PACIS 2006), 1335-1344. Iddris, & Faisal. (2012). Adoption of e-commerce solutions in small and medium-sized enterprises in Ghana. European Journal of Business and Management, 4(10). Kalakota, R., & Whinston, A.B. (1996). Frontiers of electronic commerce. Addison Wesley Longman Publishing Co., Inc.
Korper, S., & Ellis, J. (2000). The e-commerce book: Building the e-empire. Academic Press. Lawrence, J.E. (2008). The challenges and utilization of e-Commerce: Use of internet by small to medium-sized enterprises in the United Kingdom. Information, Society and Justice, 1(2), 99-113. Limthongchai, P., & Speece, M.W. (2003). The effect of perceived characteristics of innovation on ecommerce adoption by SMEs in Thailand, The Seventh International Conference on Global Business and Economic Development, 1573-1585. Lina Z., Guiling Z., & Weiwei D. (2014). Empirical analysis of factors influencing logistic service satisfaction of Customer of Taobao. Technology and Method, 33(5), 215-217. Molla, A., & Licker, P.S. (2005). E-commerce adoption in developing countries: A model and instrument. Information & Management, 42(6), 877-899. Pearson, J.N., & Semeijn, J. (1999). Service priorities in small and large firms engaged in international logistics. International Journal of Physical Distribution & Logistics Management, 29(3), 181-192. Premkumar, G. (2003). A meta-analysis of research on information technology implementation in small business, Journal of Organizational Computing and Electronic Commerce, 13(2), 91-121. Rahayu, R., & Day, J. (2015). Determinant factors of e-commerce adoption by SMEs in developing country: Evidence from Indonesia, Procedia-Social and Behavioral Sciences 195, 142– 150. Sekaran, U., & Bougie, R. (2010). Uma Sekaran and Roger Bougie, (Fifth ed.). Wiley and Sons, Ltd, Publication. Sila, I. (2013). Factors affecting the adoption of B2B e-commerce technologies. Electronic Commerce Research, 13(2), 199-236. Thabit, H. (2013). Adoption the fuzzy logic to enhance the quality of the accounting information to operate balanced scorecard-Applied on Mosul Bank for development & investment in nineveh province. M.Sc. Thesis in Accounting, University of Mosul, Iraq. Thong, J.Y.L. (1999). An integrated model of information systems adoption in small businesses. Journal of Management Information Systems 15(4), 187-214. Tsiakis, T., & Sthephanides, G. (2005). The concept of security and trust in electronic payments. Computers & Security, 24(1), 10-15.